Food glorious food! That’s what I think of when I think of Athens. 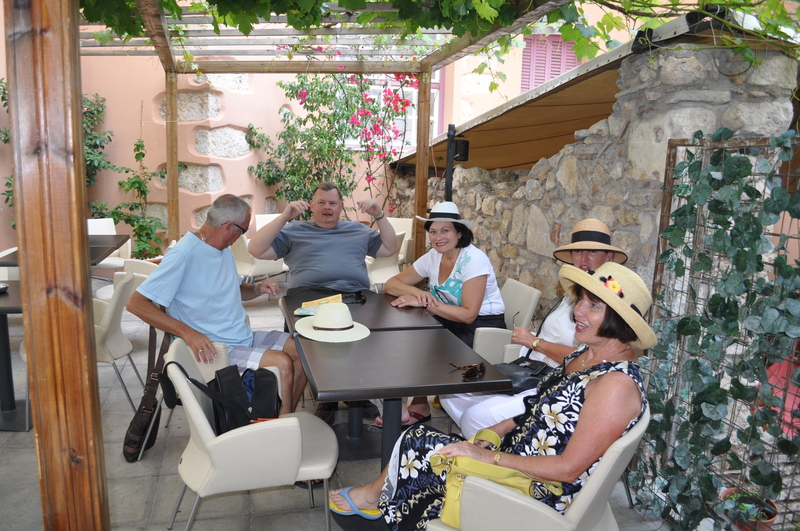 We had calamari to die for, Greek salad naturally, the best coffee, lovely Ouzo and sin of all sins – a big slice of Baklava. Well my rationale was that there could be no better place in the world to eat Baklava than in the Plaka in Athens. It was worth it – so there Jenny Craig! Don’t be put off by reports that the Plaka is too noisy, too dirty or too crowded. Many of the streets have been turned into pedestrian walkways and great little restaurants abound. Eating out is reasonably priced. If you want to splash out go to one of the rooftop restaurants with great views of the Acropolis which is lit up at night. 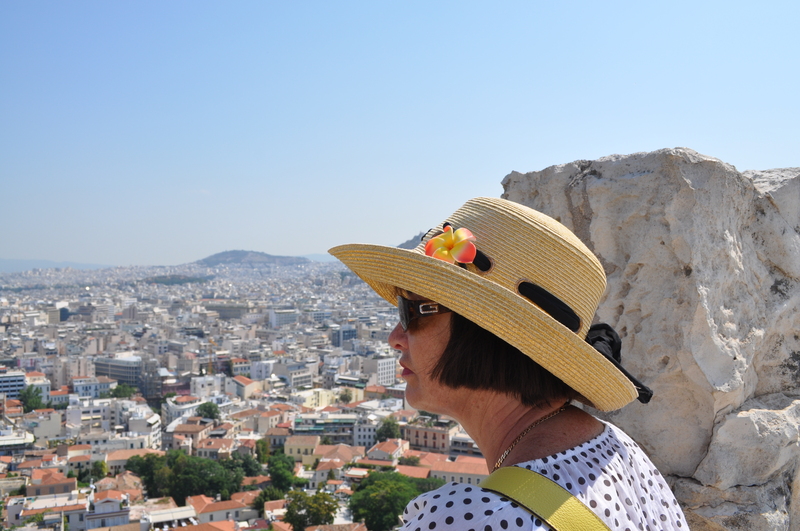 Talking about the Acropolis – now there is a place that is always crowded – no matter what month you visit. Get a good guide – a private one is very worthwhile – and get out there early in the morning while it is at least a bit cooler. Athens has tons of hotels – big and small. 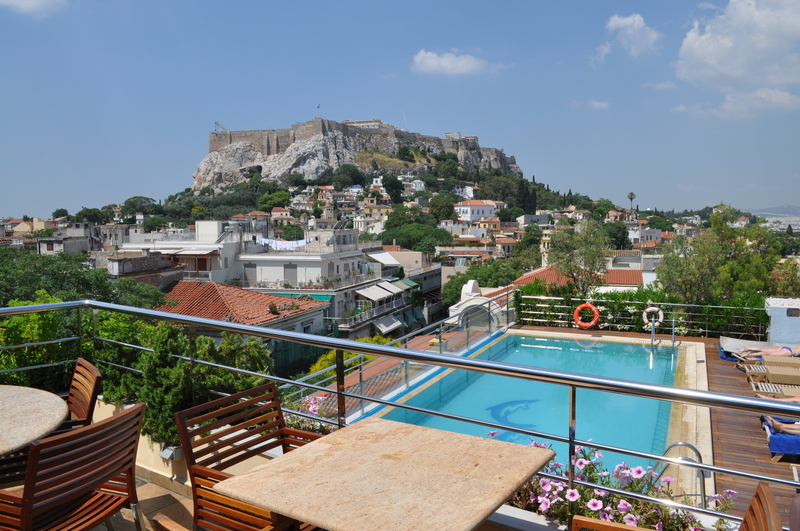 We stayed at the Herodion, a small family run hotel which had a cute little roof garden with lovely views of the Acropolis. Location is important in Athens because outside of the pedestrian streets of the Plaka the traffic is pretty heavy so you really don’t want to be on one of the main streets. 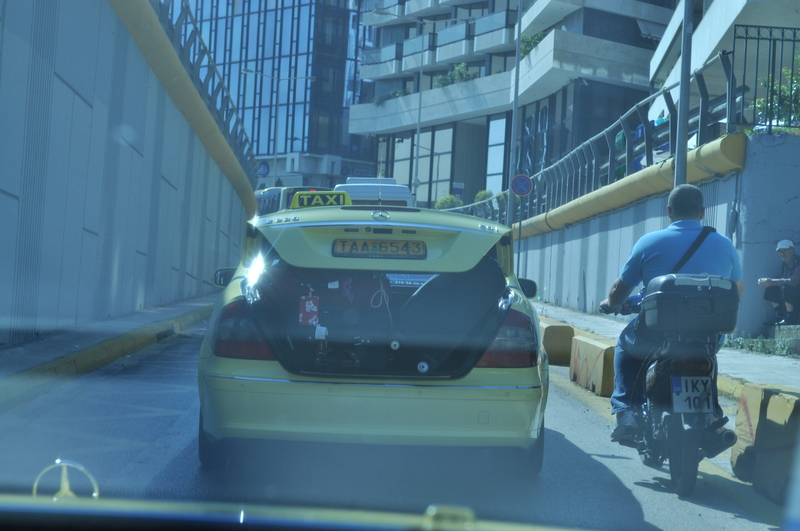 If you are visiting Athens at the end of your cruise be sure to arrange private transfers from the pier to your hotel. The pier was a crush of shouting taxi drivers, piles of luggage and bewildered cruise passengers. We were consequently very pleased to see my local rep there to meet us. With no trouble at all we were ushered into our waiting air conditioned Mercedes Benz complete with bottles of iced-water. Nice touch! Pity the trunk was a bit small for our luggage but that didn’t worry the driver who piled it in nonetheless and lo and behold – when we got to the other end we hadn’t lost one piece. Hey - hang on to my bag! Athens has been in the news a lot these days. The demonstrations were in full swing while we were there so we had to take a walk down to Constitution Square to see what it was all about. It was actually fairly peaceful and a bit Woodstock in feel. Lots of tents, hammocks and guitar strumming protesters just “hanging out”. Things did turn a bit ugly for a while and I did notice quite a bit of graffiti but I truly hope that they are able to resolve matters there. I would definitely love to return and try just one more slice of that gorgeous baklava. Beautiful Athens.... I shall come back. “As you walk down these streets remember that you are walking the same streets as St Paul, St John and probably Mary, the mother of Jesus,” our guide told us as we walked into the ancient city of Ephesus. It was also the honeymoon choice for Cleopatra and Marc Anthony. Imagine that! Excavations continue on an ongoing basis as and when funding is available and only about 10% of the city has been excavated so far. 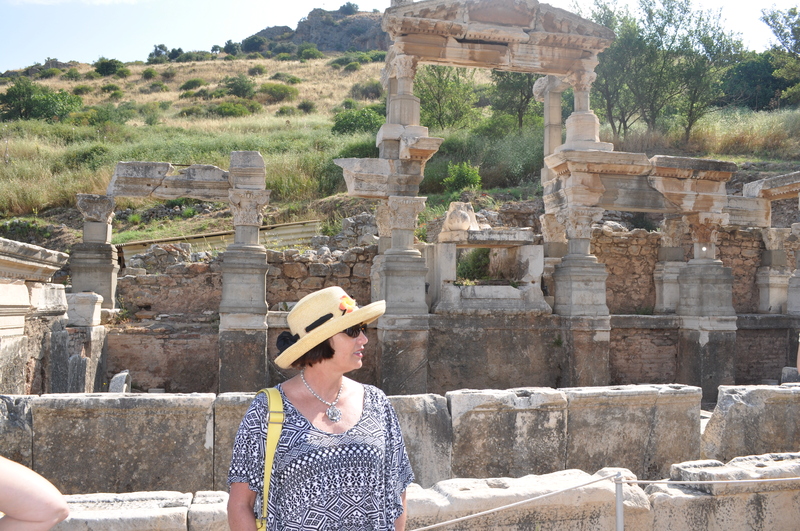 If you do have Kusadasi on your itinerary a tour of Ephesus is a must. Our guide (a high school teacher) made the place come alive for us so please don’t feel that this is just another tour of ancient ruins. Inevitably as part of our tour we ended up at a carpet weaving demonstration. Our guide joked that this was part of the tour and assured us that the proprietor was not his cousin and he wasn’t getting a commission. Honestly - they flew - they really did! 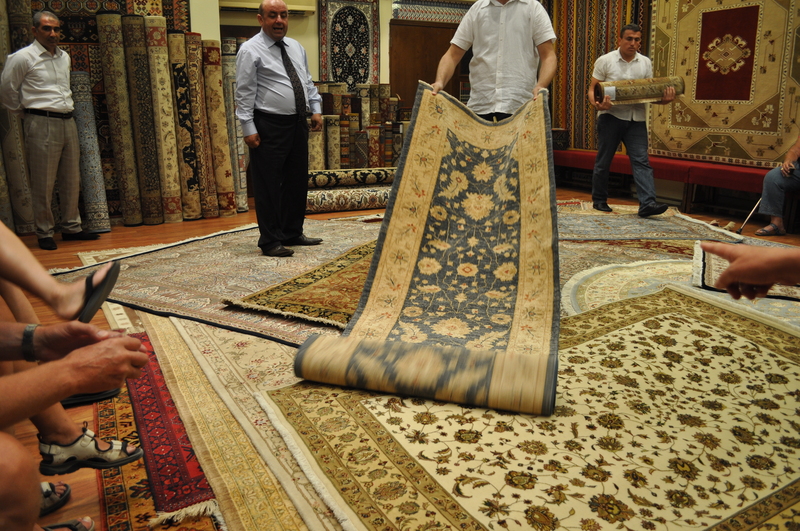 It certainly was interesting learning how the carpets were made and we were served with refreshments of our choice while a whole team of robust looking Turks rolled out carpet after carpet on the floor. When they got down to the smaller ones they skilfully spun them up in the air so we could truly say we had been to Turkey and seen a flying carpet. When the demonstration was over however the skilful carpet spinners honed in to see if they could spin a sale. Don’t get me wrong – they were quite pleasant and polite when we declined to purchase. Some of our group did indeed buy rugs and came home with some delightful examples of extremely skilful work from the carpet co-operative. Kusadasi was really not what I had expected. It is very Western in feel. The people are sophisticated, friendly and speak English quite well. 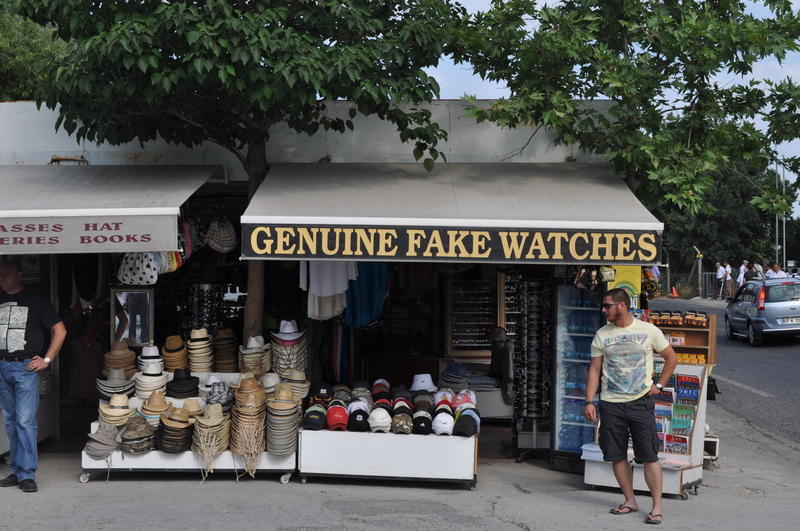 Genuine Fake Watches - gee what a find! Shopping in Kusadasi was a treat. Great silver, leather, silks and ceramics and even some Genuine Fake watches. I had to keep in mind that I was planning to return to Turkey later in my trip and the Grand Bazaar in Istanbul was calling my name. I did however make a very small contribution to the economy with the purchase of a silver necklace. Well really – I like to do my part!